Since the collapse of the Soviet Union in December 1991, the Americans have comforted themselves with the knowledge that the United States was the world's only superpower. The attacks of 9-11 demonstrated that there were still bad people who wanted to hurt the U.S., but these individuals were restricted to terror groups in caves somewhere in Afghanistan or Pakistan or the insane governments of Iran and North Korea. Unfortunately the reality is in no way that simple. Our preeminence as the world's number one technological and military superpower in grave jeopardy, and those threatening to replace us do not share our ideas of human freedom and the rights of the individual. At stake is not only preventing a bloody attack, but preserving the very existence of our nation. Both Russia and China are feverishly working on advanced weaponry which will rival that of the United States. The mass media rarely reports this fact, which is a dangerous in and of itself. To make the situation for the U.S. even more perilous, Russia and China are "strategic partners" if not unannounced allies. The United States cannot count on playing Russia and Communist China against each other. The military/technological progress made by both China and Russia is impressive. One of Moscow's pet projects is the Hypersonic Project, which is meant to give Russia a weapon capable of both striking with blinding speed and neutralizing America's stealth aircraft advantage. This cutting edge technology which could eventually put Russia in a dominant position over the United States, and is a top priority for Moscow. Hypersonic weapons are not currently covered by any international missile treaty. Russia is already predicting that its new generation of bombers, the PAK-DA, will have hypersonic weaponry. Russia is not alone in attempting to rival the U.S. in hypersonic research and development. China has reached "initial operational capability" of a aircraft killer system, referred to as DF-21D, which uses ballistic missiles carrying conventional explosives which would reenter the atmosphere at hypersonic speeds and strike U.S. warships. The Chinese missile system is believed to be already altering the balance of power in the Western Pacific. Citing a DARPA (Defense Advanced Research Projects Agency) report, the June 2013 issue of The Economist declared that "America is gradually losing the 'strategic advantage' that its stealth warplanes have long provided." Moscow is also working on advanced fighters and bombers. Rogozin recently boasted that Russia's new T-50 PAK-FA fighter will easily out perform America's troubled F-35. The Russian arms industry churning out a wide variety of new or improved weapons from small arms to nuclear submarines and ballistic missiles. 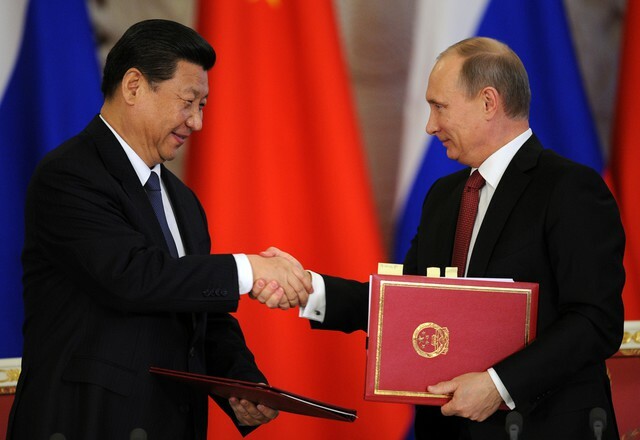 Moscow is also assisting Communist China in weapons development. Beijing is preparing to challenge the United States in the Pacific and to finally achieve a long time goal: the destruction of the democratic government on Taiwan and the subjugation of its 23 million people. The United States is responding to these grave challenges to its position in the world, or even its very existence, by cutting the defense budget. The cuts are affecting military readiness. One expert, Rick Norris, a retired intelligence analyst with 25 years experience as an active duty US Marine Corps officer and civilian contractor/researcher, related his concerns to International News Analysis Today. Norris cited a recent report on the inability of the U.S. Air Force to keep pilots due to lack of flying hours and access to the next generation of advanced aircraft, and stated that he suspects that other services will be similarly affected. As "Air Force pilots depart their service for lack of training time, is it reasonable to believe that training funds for the other services are any more forthcoming?" Norris asked. Norris praised the capability of America's newest weapons, but questioned their value without proper training. "While our Navy, Air Force and Army proudly display modern and tough to beat new weapons systems, how about the training at integrated levels to pull all those capabilities together?" America is at present the most powerful nation on earth, but there are no guarantees that we will retain this leadership. Others are working hard to replace us. As Norris relates, "our enemies, Russia and the PRC [Peoples Republic of China] are building their force structure." Neglecting our military, even in times of budget difficulties, will result in our national destruction. Our national defense must be the absolute top priority in America's expenditures, or we will simply cease to exist as an independent nation. Mr. Westerman is the editor/publisher of International News Analysis Today (www.inatoday.com. ).